Don Colleran's next auction on Thursday December 6 will include properties in and around the city centre that will have broad appeal to first time buyers, investors, or those looking for a detached family home with every amenity including schools and parks on the doorstep. No 56 Tara Grove, Wellpark, built by O'Malley construction approximately 25 years ago, remains one of the most sought after addresses in the Wellpark area. You will immediately understand why the minute you drive into this estate, which is very well designed with mature trees, space, and open green areas, all within walking distance of the city centre. Due to its spacious accommodation, location, and price this house will equally appeal to first time buyers, investors, and those looking for a family home with all services on the doorstep. Accommodation includes sitting room, kitchen/dining room, downstairs toilet, four bedrooms, and a bathroom. Advised minimum value €260,000. Open viewings Saturday 11am to 11.30am. Just around the corner in the ever popular Old Mervue, Colleran's is also selling No 18 Emmet Ave, an attractive three bedroom terraced house, again with every necessary amenity on the doorstep, including some of Galway's largest employers. Accommodation includes a sitting room, kitchen/dining room, bathroom, and three bedrooms. One of the many attractions of No 18 Emmet Avenue is an extremely large back garden offering loads of room to extend, subject to planning, and it already has a large garage/workshop at the rear of the property. If you are looking for your first home or an investment within an fabulous established community you need look no further than Emmet Avenue. Advised minimum value €210,000. Opening viewing Saturday 12 noon to 12.30pm. No 1 Beechwood Park, Ballybane, is a very bright, spacious, four bedroom detached home in excellent condition throughout and ready for immediate occupancy. Accommodation includes a very large sitting room/dining room, and a kitchen/dining room with a generous range of solid oak fitted kitchen units. There is a separate study/playroom which could easily be converted to a ground floor fifth bedroom as it is adjacent to the downstairs toilet, which could be converted into an en suite. On the first floor there are four bedrooms, three of which are double rooms, with master bedroom en suite, and tiled bathroom. Advised minimum value €265,000. Open viewing Saturday 1pm to 1.30pm. Many would have though the prospect of finding a property in Galway city for less than €150,000 was a thing of the past, but included in Colleran's auction is truly exceptional value with the sale of No 8 An Lochan, Headford Road. This is a spacious bright three bedroom apartment in a small development within walking distance of the city centre and well serviced by shops and bus service. If you are looking to get your foot on the property ladder and were losing hope, then An Lochan is certainly worth looking at. Advised minimum value of only €125,000. Open viewing Saturday 2pm to 2.30pm. 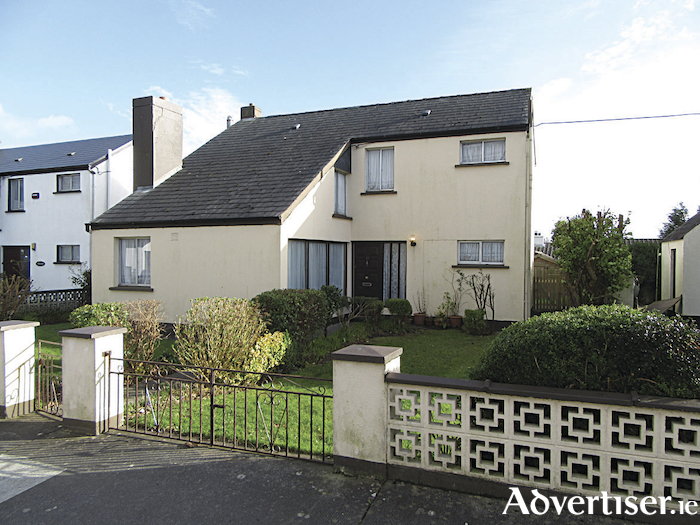 Also included in Colleran's auction on December 6 is No 11 Ardilaun Road, Newcastle. This is a rare opportunity to purchases a large detached property close to the city centre, and for the price of some semis in this popular area of town. In need of modernisation, with has clearly been reflected in the advised minimum value of €280,000, No 11 Ardilaun Road oozes potential and with a little investment it would make a fabulous home. Accommodation includes sitting room, large sun filled kitchen/dining room, sun filled conservatory, study, ground floor toilet, and on the first floor there are three spacious bedrooms and a bathroom. Viewing of this house is strongly recommended in order to fully appreciate the potential and value on offer . Opening viewing Saturday 3pm to 3.30pm. Page generated in 0.0914 seconds.